� They are a fact of life.� It rains down from above upon our newly washed cars, lawn chairs, and occasionally on us. The �it� is bird poo � or �droppings� as they are euphemistically referred to.� Although we try to avoid looking at them or discussing them, avian poo can offer up some particularity peculiar participles of purposeful perambulation. In other words, they can lead us down a purposeful path on our peregrinations of perception. To put it simply, poo can teach. � It is a fact of life that much of what goes into a bird must come out. As highly active warm-blooded vertebrates, birds are constantly going to the bathroom.� A small bird deposits a dropping every 30 minutes or so, while a larger crow sized bird meets nature�s call on an hourly basis. � A close examination, provided for instance by the glorious view imparted by a large dropping on your car windshield, reveals three components to a poo packet. (Here�s a picture of a neat little purple poo packet just to remind you of what we are talking about). Birds evacuate their wastes out of a single opening called the cloaca, so everything is wrapped into one little gift. The dark portion is made up of solid waste. This is the actual feces of the species.� The off white portion is composed of Urates resulting from protein digestion and the watery part is Urine. There, now that wasn�t so bad was it? � Just for the sake of expanding this discussion, you should be aware that there are many animals that mimic bi-colored bird droppings. They �know� that other animals tend to have the same reaction to poo as you do, so by pretending to be poo they are safe from predators. The Giant Swallowtail Caterpillar and the Pearly Wood Nymph Moth are two examples such craptic�er, I mean, cryptic coloration. � Dried bird droppings are tough to get rid of.� It�s almost like they are sticking around and begging us to pay more attention to them. Recently, the astronauts aboard the space shuttle Atlantis detected several white spots on the leading edge of their right wing while checking for potential damage after launch. NASA determined that the mystery spots were bird poo. These droppings survived the launch procedure which includes 300,000 gallons of sprayed cooling water and a 0 to 17,500 mph in nine minute acceleration! � While the shuttle wing deposits will burn up upon atmospheric re-entry, those on your picnic table still await your prying eyes.� O.K., let�s take a look to learn more. (If you didn�t take a look at the purple poo picture previously posted, you might want to peek posthaste. )� The cluster of droppings on my picnic table are all colored purple � like the photo example � and are the product of Robins. It is of absolutely no coincidence that the scientific name of Robin is Turdus, by the way. The robins are eating the fruit of the White Mulberries that are now ripening. � You might want to take a minute to look at this site detailing a few facts about Mulberry trees.� The important thing to note are the clusters of fruit which look like elongated raspberries.� These are simply irresistible to the fruit eating robins, so they devour them with gusto and pass �em through with equal speed.� Mulberries depend upon birds such as the robin to distribute their seeds.� The quick passage through the digestive system insures a safe landing far from the parent tree. � There are currently twelve bird droppings on my picnic table and each is loaded with tiny cream colored seeds (5 -16 seeds per). This averages about 10 seeds per dropping. Given the size of my picnic table, it looks like there are about 7 seeds per square foot. That, my friend is the reason Mulberry trees are so successful at getting around. � Now, you�ve no doubt heard the phrase about making a silk purse from a sow�s ear, so it�s time to find the silk lining in these mulberry-stained bird droppings and get this thing done. The reason robins have Mulberries to eat is because of silk.� White Mulberries are the food plant of the oriental silkworm. 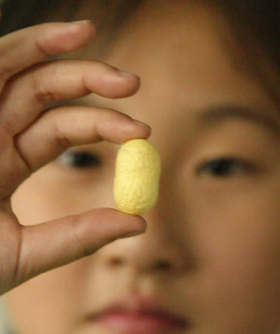 The plant originates from China where silk production began thousands of years ago. � Silkworms (take a look at one here) feed only on White Mulberry leaves.� As a domestic animal, they are fed until they reach a few inches in length.� Once at full size, the caterpillars weave a peanut shaped cocoon (see here) and pupate within.� The cocoons consist of a mile or so of continuous fine silk, so it is at this stage that they are boiled (killing the pupae, of course) and unraveled to produce commercial silk. Natural silk production is still practiced today, so silk purses are still available as far as I know. � The date of the above entry is July 16th, 1841 � exactly 166 years and a day ago. The silkworm experiment failed, but the Mulberry trees survived as seed escapees.� Fruit eating birds continue to spread Mulberries and therefore our windshields continue to get plastered with history.